When Sgt. 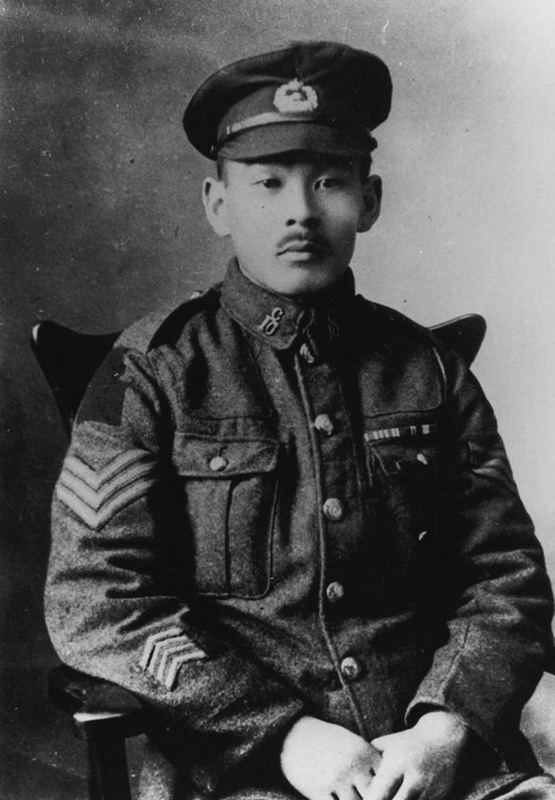 Masumi Mitsui passed away on April 22, 1987 at the age of 100 years he was one of the last surviving Japanese Canadian volunteers of World War I. Having emigrated to Canada in 1908 from Fukuoka-ken, Sgt. Mitsui had a distinguished service record that began in 1916 when he travelled to Calgary to enlist with the 192nd Overseas Battalion. He embarked for Europe in late 1916 and in January of the following year was ordered to France where he joined the 10th Battalion, 2nd Infantry Brigade, 1st Canadian Division. He fought at Vimy Ridge, and four months later at nearby Hill 70, he led 35 men into battle. Only five survived and for his own ‘conspicuous bravery and distinguished conduct,’ Mr. Mitsui was awarded the the Military Medal for Bravery. He was wounded in action but was able to return to the front, where his heroism led to further honours—the British War Medal and the Victory Medal. Honourably discharged in 1919 with the rank of Sergeant, Mr. Mitsui returned to BC, settling on a farm near Vancouver. He was president of the all Japanese Canadian Legion Branch No. 9 when the BC government finally voted to grant the franchise to the issei veterans of WWI. At the outbreak of World War II, Mr. Mitsui, his wife Sugiko, and their four children ran a 17-acre poultry farm in Port Coquitlam. After Pearl Harbor, when he learned that all Japanese Canadians were to be stripped of their possessions and freedoms and forcibly removed from the coast, he flung his medals on the floor of the BC Security Commission office. The family was separated by the war: the parents and Harry, their youngest son, were sent to Greenwood, BC; the two daughters, Lucy and Amy, went to school in Alberta; while George, the eldest, went to work in Ontario. For years after the war, the Mitsuis tried unsuccessfully to return to their Port Coquitlam farm. Their repeated request for fair compensation was denied and eventually the family was re-united in St. Catherines, Ontario, where George had found work as a farmhand, and in time, they settled in Hamilton. Mr. Mitsue was an honoured guest at the re-lighting of the lantern atop the Japanese Canadian War Memorial in Stanley Park on August 2, 1985. The light, that had been extinguished sometime during the Japanese Canadian internment, was re-lit at a ceremony attended by many dignitaries and representatives from the various Japanese Canadian organizations. David Mitsui is the grandon of Sgt. Masumi Mitsui. He shares with Bulletin readers his thoughts on his grandfather and other topics. I think it goes back to being born in Japan; his father was a military naval officer. He had tried to enlist in Japan but failed the exam and was rejected by the military and then he came to Canada. In WW1 he wanted to show his patriotism to Canada and that is why he went to Calgary to enlist. 222 JC men enlisted. My grandfather never talked about the war, what I learned about the war, I learned through military records, my father and aunt. They lived through the internment (sent to Greenwood) and my grandfather had the job of working in security. During that time, he would tell a few stories to his children. I remember being told that when my grandfather would lead men into battle, he would look for any alcohol in the small French towns along the way so that he could motivate them to lead on. He would give them a sip of whiskey or whatever he had in his canteen when they arrived. Like most men who fought in WWI he never talked about it and always wanted to forget about it. He was one of the few that could speak English so his commanding officers were able to understand him. After the war, every year on Remembrance Day, in his own home, he would put on his uniform and his medals to honour his fellow soldiers. He never went to a Remembrance Day ceremony until 1983 when he was invited to attend the Hamilton Remembrance Day ceremony. He respected and fully honoured the military but did could not come to accept that the BC government had taken away his farm and that his family was interned. He always wanted financial redress. The farm sold for $895 and he had to pay for his family being interned. Recently that same farmhouse was on the real estate market in Port Coquiltam for $800,000 just for the house and a bit of property. In 1985 he was so proud to be part of the ceremony to relight the cenotaph; he was 96 and one of the last surviving JC veterans of WWI. My grandfather said, after relighting the flame, “I have completed my last duty to my comrades.” My two aunts accompanied my grandfather to the ceremony. It started when I was quite young, when my father told me about my grandfather, I was five or six at the time. I was visiting my grandfather on Remembrance Day, sitting on his lap. He was wearing his WWI medals and I asked if I could have them. He said, one day you will receive them. After he died in 1987 and his will was read, I received his medals. Shortly after his death, in 1991, I received a call from the Calgary Highlanders Regimental Secretary of the former Museum of Regiments in Calgary, now The Military Museums of Calgary. They indicated that they were developing a display on the 10th battalion and I gave permission to take photos of the metals. In 1993 I was invited to unveil the display, and that lead me to do a lot more research. In 2003, I got a call from an amateur historian from Ontario who was very interested in WW1 and had researched many battles in France. In Agincourt, France they were celebrating their 80th anniversary of being liberated from German occupation. My grandfather’s unit was involved in the liberation of this town from the Germans. In September 2003, 30 of us went to Paris, and then travelled to the village of Agincourt. They had a celebration that included the mayor, a parade, bands playing and a banquet was held in the potato grading station (big warehouse) with 500 people attending. The French people in the village were so thankful to the veterans. I was also able to see Hill 70 where my grandfather won his military award for bravery. It was very humbling to be on the same ground, where there was a major battle. My understanding is that officers did not understand some of the JC veterans due to language barriers and there were lots of stereotypes including that JC soldiers were lazy, couldn’t understand English and couldn’t be trusted. The JC soldiers prove themselves to be very brave and then the other soldiers started to respect them. A lot of officers refused to accept them into their battalion and if they did, many of them were skeptical at first.